Frank Lawler (clerk, Treasury Department). Roseanna Custis (widow of William H. Custis); Susannah E. Custis (clerk, Treasury Department); Greenberry J. P. Belt. John Kingdon (clerk, Treasury Department). Wesley D. Smith (clerk, Land Office). 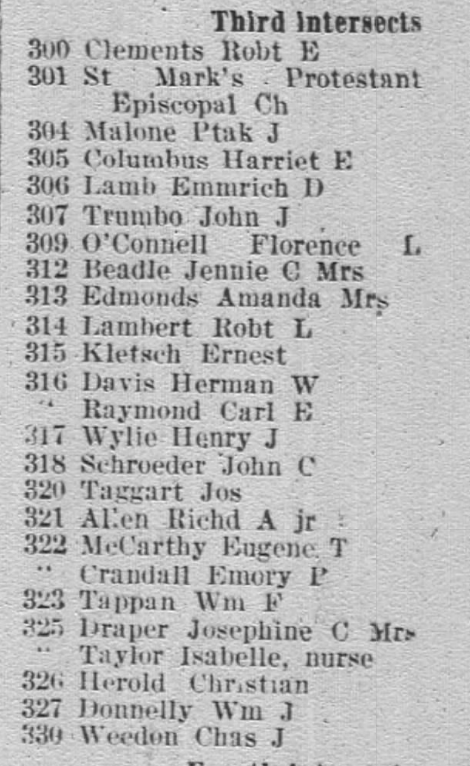 John Kingdon (clerk, Treasury Department); Charity A. Smallwood (servant); Charles C. Bowling (butter). Charles C. Bowling (butter and eggs). Alvan [sic] H. Doan (clerk, Pension Office); John A. Botts (clerk, Quarter-Master General’s Office). Alva H. Doan (clerk, Pension Office). 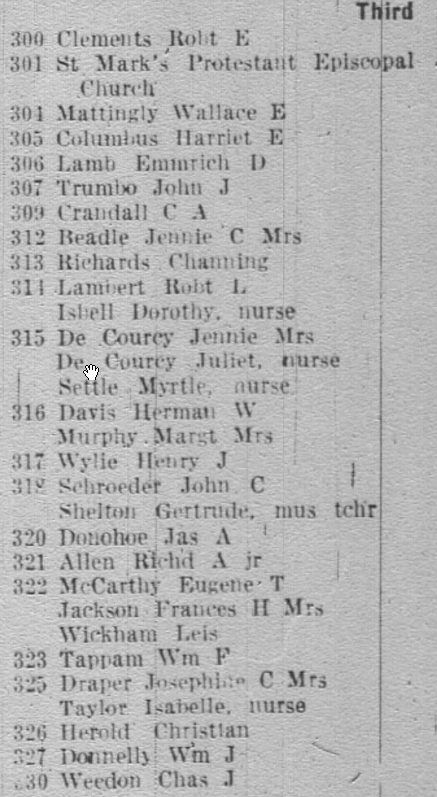 Ida B. Keirle (Bureau of Printing): Lucretia M. Keirle (widow of Henry C. Keirle). Sadonia C. Appler; Ida B. Keirle (Bureau of Printing); Lucretia M. Keirle (widow of Henry C. Keirle). 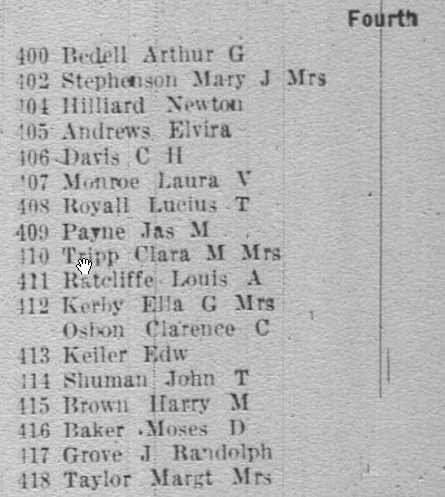 Ida B. Keirle (Bureau of Printing): Lucretia M. Keirle (widow of Henry C. Keirle); Sadonia C. Appler. Ida B. Keirle (Bureau of Printing); Mary L. Keirle (widow of Henry C. Keirle). 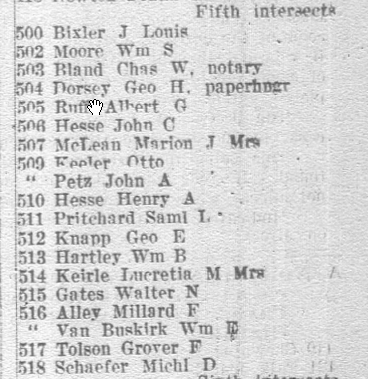 Rolandus R. Rhode (stair builder); Ida B. Keirle (Bureau of Printing): Lucretia M. Keirle (widow of Henry C. Keirle); Byron Kingdon (student). 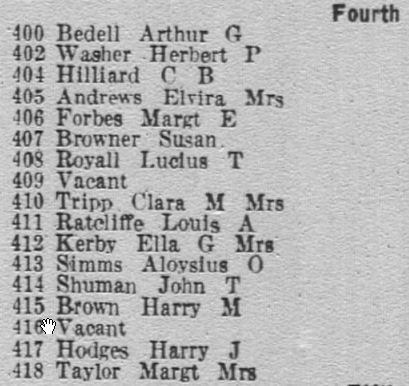 Ida B. Keirle (Bureau of Printing): Lucretia M. Keirle (widow of Henry C. Keirle); Byron Kingdon (clerk). Sadonia C. Appler; Ida B. Keirle (Bureau of Printing); Mary L. Keirle (widow of Henry C. Keirle). 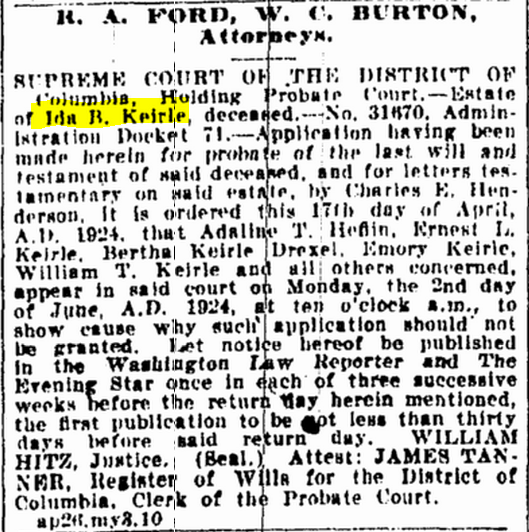 Ida B. Keirle (Bureau of Printing): Lucretia Keirle. Sadonia Appler; Ida B. Keirle (clerk). 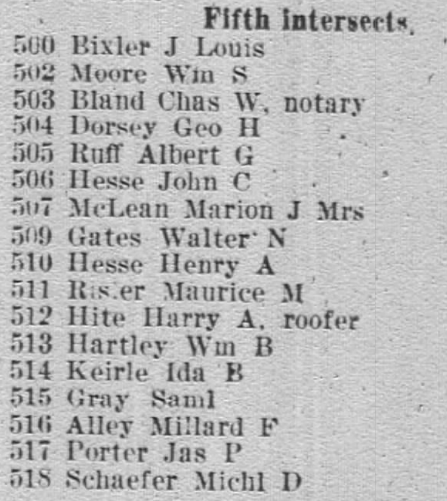 Sadonia C. Appler; M. L. Keirle (widow of William [sic] C. Keirle); Ida B. Keirle (Bureau of Printing). 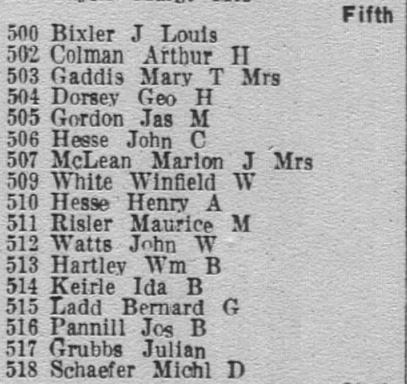 Byron Kingdon (agent); Ida B. Keirle (Bureau of Printing). Ida B. Keirle (Bureau of Printing); Lucretia Keirle (widow of Henry C. Keirle); Byron Kingdon (stenographer). Lucretia M. Keirle (widow of Henry C. Keirle); Ida B. Keirle (Bureau of Printing). Ida B. Keirle (Bureau of Printing). 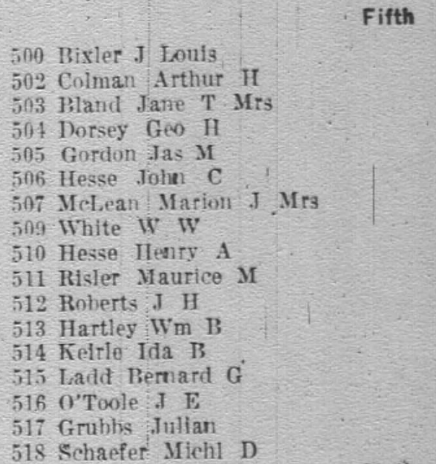 Ida B. Keirle (operator, Bureau of Printing, boards); Lucretia M. Keirle (widow of Henry C. Keirle). Ida B. Keirle (operator, Bureau of Printing). 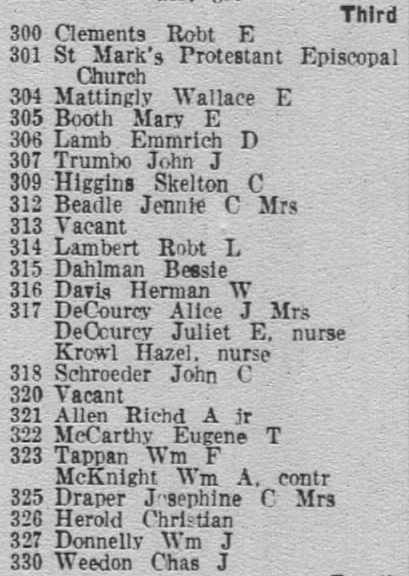 Ethel Vought; Max Vought (toolmaker, Navy Yard); Ida B. Keirle (operator, Bureau of Engraving and Printing). 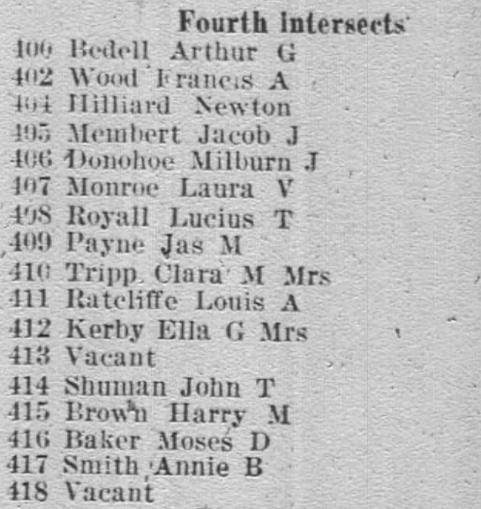 Washington Evening Star, 26 April 1924, p. 31. 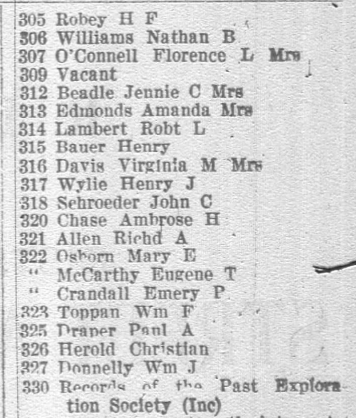 “The Social World.” Washington Evening Star, 3 August 1895, p. 6. 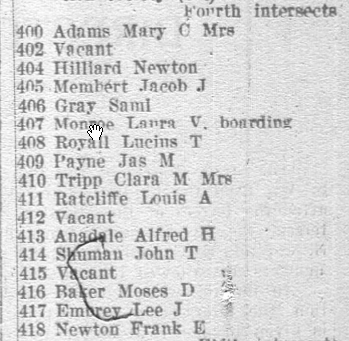 “Real Estate Transfers.” Washington Post, 14 November 1915, p. RE11.